Figure 12.3. 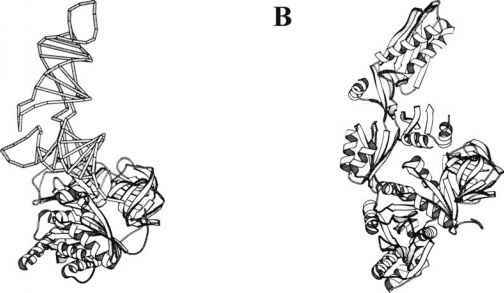 A comparative view of the ternary complex EF-Tu:GTP:Aa-tRNA (left) and EF-G (right): "molecular mimicry". (Reproduced from P. Nissen, M. Kjeldgaard, S. Thirup, G. Polekhina, L. Reshetnikova, B.F.C. Clark & J. Nyborg, Science 270, 1464-1472, 1995). the protein are 120 x 60 x 50 A. (the changeable "effector loop" b«a and the G'-subdomain are in parentheses). Despite the lack of great sequence similarity, domain II of EF-G superimposes very well upon domain II of EF-Tu. It is also an antiparallel b-barrel, but differs from the homologous domain of EF-Tu by the presence of an N-proximal b-hairpin external to the barrel. Domain V of EF-G is adjacent to the G-domain and occupies the position that is similar to that of domain III in EF-Tu relative to domains I and II. No structural homology, however, can be revealed between domain V of EF-G and domain III of EF-Tu; in contrast to all-b fold of domain III of EF-Tu, domain V of EF-G has a bilayer babbab structure and strongly resembles the ribosomal protein S6. The functions of the group of domains I, II and V may be partly equivalent to those of the corresponding domains of EF-Tu, such as GTP binding and GTP cleavage (domain I or G), conformational changes affecting the affinity to the ribosome, intractions with the factor-binding site of the large ribosomal subunit. 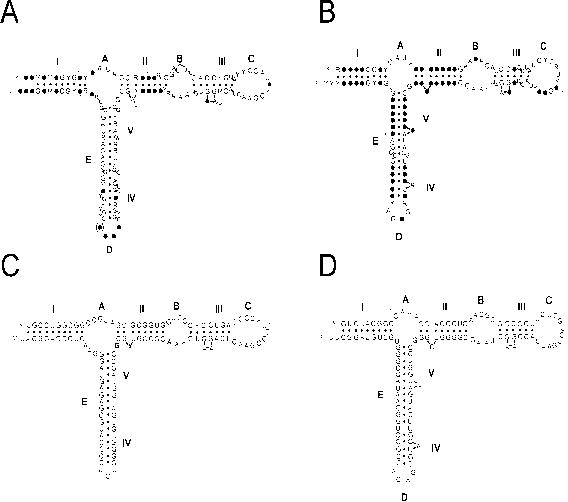 ba[b«a]bbabaPa[PPPPPaaalPa domain IV pair in EF-G mimic those of aminoacyl-tRNA in the complex with EF-Tu (Fig. 12.3). Thus, the overall appearance and even some details of the EF-G structure and the structure of the aminoacyl-tRNA:EF-Tu:GTP complex are similar, domain IV and domain III being analogs of anticodon-dihydrouridylic limb and acceptor-thymidyl-pseudouridylic limb, respectively. EF2 (bacterial EF-G or eukaryotic eEF2) interacts with GTP and the ribosome. This interaction induces GTPase activity, and GTP is cleaved to GDP and orthophosphate. The interaction (complex formation) of EF2 and GTP with the pre-translocation ribosome results in a quick translocation, upon which EF2, GDP, and orthophosphate are released from the ribosome. It is domain I, or G-domain of EF2 that specifically binds GTP (and GDP). The same domain is responsible also for catalyzing the GTP hydrolysis. The organization of the GTP/GDP binding site and the GTPase center of EF2 seems to be very similar to that in the G-domain of EF1 (EF-Tu; see Section 10.2.1). The interaction of EF-G (or eEF2) with GTP, however, is considerably weaker than the analogous interaction of EF-Tu (or eEF1) with GTP. The resultant EF-G:GTP complex is unstable and easily reversible (the eEF2:GTP complex is somewhat more stable). Nevertheless, this complex is being formed and its formation is a prerequisite for the interaction of EF2 with the ribosome. GTP is thought to induce a conformational change in the protein (EF-G or eEF2) which results in a strong affinity of the factor to the ribosome. GTP is highly specific in this respect and cannot be substituted for either by other nucleoside triphosphates or any nucleoside mono- or diphosphates. GTP can, however, be replaced by the non-hydrolyzable GTP analogs, e.g. guanylyl methylene diphosphonate (GMP-PCP) or guanylyl imido-diphosphate (GMP-PNP) (see Fig. 9.9). The EF-G:GTP (or eEF2:GTP, in eukaryotic systems) complex can bind to the functioning (translating) ribosome as well as to the vacant ribosome, or even with the isolated large ribosomal subunit. The binding site of EF2 on the large subunit appears to be located at the base of the L7/L12 stalk (see Section 9.4); in the whole (70S or 80S) ribosome it is found near the interface of the ribosomal subunits, in the region of the tRNA-binding sites. The binding of EF2:GTP to the ribosome is prevented by the aminoacyl-tRNA bound in the ribosomal A site, as well as by the presence of the other protein factor, EF1 (EF-Tu or eEF1), on the ribosome. In all cases, the binding of the EF-G:GTP complex or the eEF2:GTP complex to the ribosome or its isolated large subunit results in cleavage (hydrolysis) of GTP. The ribosome seems to induce GTPase activity of EF2; in other words, it is thought that the GTPase center is present on EF2 but is inactive in the absence of the ribosome. If a ribosome is vacant or the large subunit is used instead of the whole ribosome, then the GTP is simply hydrolyzed, without being coupled with any events of elongation. The EF2-catalyzed hydrolysis of GTP on the ribosome results in EF2 being in a complex with GDP. However, GDP is incapable of supporting the EF2 affinity to the ribosome; therefore, the EF2:GDP complex is released from the ribosome and subsequently dissociates. In other words, in this case EF-G (eEF2), in combination with the ribosome, serves solely as GTPase. However, if these reactions involve the pre-translocation state ribosome, then in addition to GTP hydrolysis, participation of EF-G (eEF2) will result also in translocation. The question then arises as to which of the sequential reactions involving EF2 is directly coupled to the translocation. For a long time translocation was thought to be an energy-consuming process and to be directly coupled with the GTP hydrolysis on the ribosome. Both of these assumptions turned out to be incorrect. First of all, translocation was shown to be thermodynamically spontaneous (downhill) step accompanying by the release of free energy (see below, Sections 12.3 and 12.5.2). Moreover, the assumption about the coupling of translocation to GTP hydrolysis has been rejected on the basis of direct experiments wherein a nonhydrolyzable GTP analog was used instead of GTP: the catalysis of translocation was observed when pre-translocation ribosomes interacted with EF-G and GMP-PCP or GMP-PNP, that is without GTP hydrolysis (Inoue-Yokosawa et al., 1974; Belitsina et al., 1975; Modolell et al., 1975). It followed that just the attachment of EF-G:GTP or EF-G:GMP-PCP (GMP-PNP) to the ribosome was capable of promoting (catalyzing) translocation. There are two possible explanations here: (1) either the attachment (affinity) of the protein to the ribosome exerts some force, directly shifting the tRNA molecules in the ribosome, or (2) the kinetic barriers for spontaneous translocational movements become decreased when EF-G is attached to the pre-translocation ribosome.